CARVE YOUR MARK IN THE VERY FABRIC OF SPACE! When I first played Quantum, I found the game laid out in front of me quite daunting. I’m no master of strategy, and this seemed like a game which required a lot of it. In Quantum players roll dice and place them in various galaxies in a bid to colonise planets, winning by reaching a certain number first. The numbers on each players dice represent the type of ship they have deployed, each ship has a different set of movements and behaves differently in battle. I compare the game to chess, mainly because of the way in which players move ships and how placement is so important. The game adds variety by factoring in ‘buff’ cards earned through research which can change how players deploy ships or engage in battle. Some may find it difficult to initially get their head around the movement rules, but once understood, this is a fun and rewarding play. Cards and location tiles are high quality however I expected a little more from the player boards, and the edition I played suffered from ‘sticky dice’ which after some research appears to be quite common in this game. However don’t be put off by minor component issues and give this game a go. Our group has had a lot of fun with this game for the past several days. It is a great casual game that doesn’t take a long time to complete, but is still a relatively deep strategic game. We found ourselves having a good understanding of play after the first game or two, but after five or six games, still discovering new ways to gain the advantage over an opponent. The fact that the play space is so fluid dramatically adds to the replay value of the game. The galaxy is essentially completely different each time you play. The quality of the game is a little bit lacking. I really wish that the game tiles and player boards had rounded corners and were of a bit higher quality stamp/punch. I noticed that some of the cardboard corners were bent/frayed right out of the box before we ever played once (an example of high quality cardboard pieces being Tokaido or Takenoko). We are the Misery Farm. 3 Ladies, an assortment of generic gaming buddies, and a*uva lot of games. Here you’ll find humourous, sarcastic, or just plain drunk reviews of board games and board game-related stuff. Ultimately we live in hope of less dice. Please give us a read, we hope you like us but if you don’t then that’s fine too. Do you like strategy? Do you like gratuitous space battle? This is the game for you! Each dice roll represents a ship, each ship has an ability, each die results has its own limitation and advantage. Face off against your opponents by mixing random die rolls with strategic movements while weighing possible results of your attack… with addition? Intriguing? All questions aside, YES! this is a fantastic game collaborating strategy, die rolls and special powers that lend themselves to your style of game play. You can earn special abilities by “pooping” (I know, you’ll understand if you watch the SU&SD video review *highly recommended*) quantum cubes onto planets by organizing your ship values into orbit to match the value of the planet. First to place their last quantum cube wins, but wait… There is more to it, you will be competing for the limited quantum space on each planet so you may need to blow up a ship, or two, which is a strategy all to itself. Earn dominance by blowing up enemy ships to place a cube ANYWHERE. Engage your opponents in battle by trying to overthrow their space to rob them of the sum they need to claim precious space on a planet. Each die roll during battle is added to your ship value and lowest total wins! This game is GREAT for any level of gamer, I have played with fellow avid, casual and social gamers and all have been left wanting more. You can even customize your own playing field with the tiles available to you to pander to a lust of gratuitous space battle or a languid civil game of who can explore the most space first. F.Y.I. NEVER! never, never, under estimate the player in last place, the moment you let them slide because they haven’t come nearly as far as you is just when they pull ahead and slide a cube in for the win. 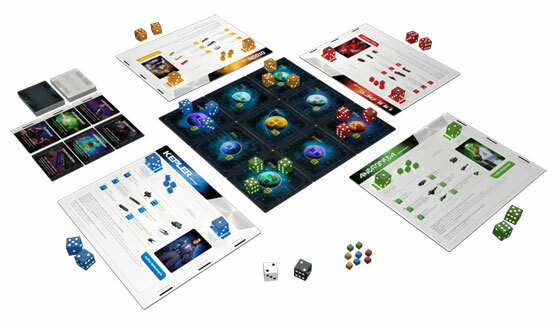 I love this game – it has everything I want superficially = space theme, dice, fighting, and easy! It definitely doesn’t disappoint either – after 3 different times playing, I have not experienced a single similarity. Absolutely brilliant. The dice are big and beautiful, the mechanics used in the game are extremely elegant and simple. The setup is relatively quick, and the insert is functional. I feel proud to own this game. 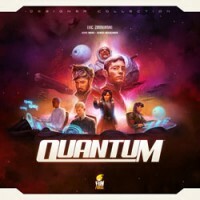 Add a Review for "Quantum"